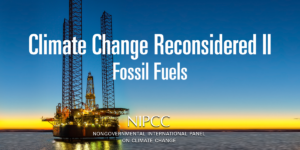 The fifth volume in the Climate Change Reconsidered series, Climate Change Reconsidered II: Fossil Fuels, produced by the Nongovernmental International Panel on Climate Change (NIPCC), was publicly released on December 4, 2018 in Katowice, Poland — the host city of the 24th session of the Conference of the Parties (COP 24) of the United Nations Framework Convention on Climate Change (UNFCCC). The 768-page print edition was released in March 2019 and is available for purchase online at the Heartland Institute store and at Amazon.com. A Kindle ebook edition is also available. The Nongovernmental International Panel on Climate Change (NIPCC) is an international network of climate scientists sponsored by three nonprofit organizations: the Center for the Study of Carbon Dioxide and Global Change, the Science and Environmental Policy Project (SEPP), and The Heartland Institute. It was convened in 2003 to provide an independent review of the reports produced by the United Nations’ IPCC. Watch video of the public release of Climate Change Reconsidered II: Fossil Fuels on December 4, 2018 from Katowice, Poland.